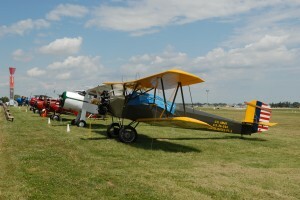 July 25, 2013 – A true paradise for enthusiasts of radial engine aircraft will be blooming next week as the Vintage Aircraft Association (VAA) hosts the Round-Engine Rodeo during EAA AirVenture 2013. View the 2013 AirVenture photos here. Dozens of the aircraft from aviation’s golden age are scheduled to participate, ranging from rare birds from the 1920s through some of the legendary airplanes from the pre-World War II era and even into the 1960s. Many of the airplanes will be part of the “Vintage in Review” programs held at the VAA Red Barn area throughout the week, as well as the EAA “Return of Champions” salute of past Grand Champions and Reserve Grand Champions on Phillips 66 Plaza. Some of the airplanes scheduled to be part of the event is a rare Waco EQC-6 – one of just three flying in the world – as well as airworthy Howard 500s from the 1960s, a Stinson trimotor, plus biplanes ranging from the Jimmie Allen Junior Speedmail to elegant Beech Staggerwings. “When it comes to beautiful vintage aircraft, it just doesn’t get any better than what you’ll see at Oshkosh all week,” Krog said. Although pre-event activities originally scheduled for Hartford Municipal Airport (HXF) on July 26-28 prior to AirVenture will not be held, the airport remains an excellent “final stop” staging area just 45 miles south of Oshkosh. The airfield has 24-hour self fueling and turf runways, and is home to many vintage aircraft and enthusiasts who participate at AirVenture each year.